Randox recently launched the Familial Hypercholesterolemia (FH) Arrays I & II, diagnostic tests which enable the detection of mutations associated with FH. We spoke to Dr Martin Crockard, Head of Molecular Laboratory, at Randox Laboratories, to find out more about FH, and learn about some of the features and benefits of the FH Arrays. AM: What is familial hypercholesterolemia and why is it important to genetically test for the condition? MC: Familial Hypercholesterolemia, or FH for short, is a common inherited genetic condition which affects the body’s ability to process LDL-cholesterol, leading to a build-up of cholesterol in the arteries. If untreated, this can lead to early onset coronary heart disease. Recent studies have shown that FH is as prevalent as every 1 in 250 in some populations, yet it is estimated that only 15-20% of individuals with FH are diagnosed. Clinical diagnosis of FH can be difficult and is often based on outward symptoms, such as xanthomas, (which are a build-up of cholesterol on the eye lids or on the tendons), or the presence of arcus cornealis; a white deposit of cholesterol in the outer rim of the iris. However, many patients do not exhibit these outward signs, particularly children. Diagnosis can only be confirmed through genetic testing for FH, which will allow patients to be placed on appropriate lipid lowering therapy as soon as possible. Importantly, the nature of this genetic disorder means that 50% of the FH carrier’s close relatives will also have FH. It is therefore very beneficial to have such first degree relatives tested for the same mutation as the index case (the first person in the family to be diagnosed). This will help in the diagnosis of other family members, many of whom will be unaware of their condition. This will allow much earlier clinical intervention, which has much greater success in lipid lowering. 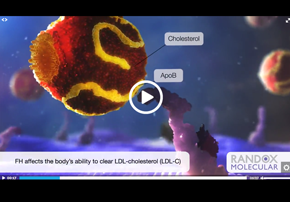 AM: Randox has recently launched the Familial Hypercholesterolemia (FH) Arrays I & II. Can you tell us a little about these? MC: The Randox Familial Hypercholesterolemia (FH) Arrays I & II utilise innovative biochip technology, developed by Randox, to simultaneously test for 40 of the most common mutations seen in cases of FH. Known as multiplexing, the arrays are capable of detecting multiple targets in a single test to accommodate wider test panels and improve lab efficiency. The mutations detected with the FH Arrays I & II are comprised within three main genes implicated in FH; the low density lipoprotein receptor (LDLR) gene, the Apo-lipoprotein B (ApoB) gene and the proprotein convertase subtilisin/kexin type 9 (PCSK9) gene. AM: What are some of the benefits the assays offer over current NGS testing for FH? MC: In the absence of a reliable and cost-effective assay, NGS is often defaulted to in cases of suspected FH to cast a wide net and ensure any mutations present are detected. However, NGS is an expensive and inefficient method for such testing, with turnaround times of weeks to months leading to delays in patients receiving appropriate early interventional treatment. The Randox Familial Hypercholesterolemia (FH) Arrays I & II now offer a cost-effective and reliable solution for laboratories testing for FH, targeting the most common mutations identified within UK and European populations for accurate detection without the need for whole genome sequencing. CE marked for routine clinical diagnostic use, results can be obtained from extracted genomic DNA to readout in just three hours for rapid diagnosis and initiation of treatment. Available as two 20-plex assays, the kits allow for full 40-mutation screening across both kits, or specific known mutation screening on one kit for cascade testing of family members of a known FH patient, delivering further cost savings. Batches can be run with as little as 3 samples or as many as 54 samples for flexible and efficient working. AM: You mention the assays are based on biochip array technology developed by Randox. How does this technology work? MC: The biochip detection system is based on a chemiluminescent signal. This is the emission of light, without heat, as a result of a chemical reaction. An enzyme is used to catalyse the chemical reaction on the biochip which generates the chemiluminescent signal. The light emitted from the chemiluminescent reaction that takes place in each target location, known as a discrete test region (DTR), is simultaneously detected and quantified using a Charge - Coupled Device (CCD) Camera. This CCD Camera simultaneously records the light emission from all the discrete test sites on each biochip on the biochip carrier. Each Biochip contains internal quality control sites, which are always on the same position on every biochip. The control DTRs have set target levels in order to identify problems. If the levels for these control DTRs fall outside specified target ranges, an error code will be generated instead of a result, indicating an inaccurate result. The Evidence Investigator is the world’s first platform allowing consolidation of immunoassay and molecular diagnostics with protein and DNA based biochips, delivering cost savings and improving laboratory efficiency. The Investigator has the ability to process 702 tests in 70 minutes using the protein arrays and it can also detect up to 40 mutations, SNPs or pathogens in as many as 54 samples at once, in as little as three hours for molecular applications. The intuitive software means no data interpretation or manipulation of results is required, the test result is automatically generated, reducing the score for operator error and improving workflow through delivering rapid results. Dr Martin Crockard was speaking to Anna-Marie MacDonald, Editor for Technology Networks.